Kids are never too young to learn about science. It was that idea that motived Bonnie Everts to expand SELF, International, a nonprofit that once focused on public health in the African country of Ghana, and move it closer to home. The new mission, Everts said, is to bring high quality STEAM educational opportunities (science, technology, engineering, art and math) to kids from low-income families in Minneapolis. Their new undertaking, said Everts, is to give quality educational experiences to under-represented students in the hope of helping reduce the public school achievement gap. “SELF gives students something to do during non-school hours and in the summer. Students will be more prepared and confident. We fill the opportunity gap in order to help reduce the achievement gap,” she said. The group’s new project, “Urban Roots: the Science of Food,” started last spring as an after-school program. The students studied seed germination, soil science, composting, photosynthesis, fermentation and a long list of other food scientific topics, with the assistance of volunteer students and scientists from the Food Science and Nutrition Departments at the University of Minnesota. SELF has partnered with the Boys and Girls Club, across the street from the Bryant Community Garden, where the students are growing vegetables. The kids spent one day a week in a laboratory workshop and one day in the garden. “We made foods related to our studies,” Everts said. “We made Swiss chard chips with Tzatziki sauce, spring rolls with mint, a quinoa salad and hummus,” Everts said. The end of the project was celebrated with a summer vegetable stir-fry from their garden produce and a tasting of pickles made earlier in the season. We tried a fresh picked cucumber, Everts said, and the pickles they made. “We talked more about preservation of food and why we use vinegar. Drew Carter, a student research volunteer from the University of Minnesota’s Department of Food Science, guided the students making the stir-fry,” she said. Two groups, younger students, mostly first and second graders, and older kids, ages 8 to 11, participated in focused sessions. For example, on a mid-August day, the group of younger students ended up at the garden, learning how microbes work. A week earlier, each of the kids had added their own germs to a petri dish and then opened the dishes to see what microbes grew during the week. They had also worked with “good” microbes, sampling a homemade yogurt drink, also started the week before. Drew Carter helped pour the yogurt drink into little cups and let each child choose a flavor to add. Microbes were not the only things the kids got to grow. Their garden plot was filled with vegetables, some planted directly in the ground, some planted in pots and some in straw bales. Rabbits and squirrels had gotten to some of the produce, including the watermelon and most of the ripe tomatoes, so Everts had to resort to buying some at the farmer’s market. “Do you see that the vegetables in the pots were safe from the squirrels? What other way could we protect the vegetables, next year,” Everts asked the crowd. “Put up a sign, ‘No squirrels,’ ” answered one of the students. “Put up a fence,” said another. “Grow them in pots,” said a third student. Everts brought out some ripe tomatoes, onions and cilantro, letting the students chop them up for the salsa. “Wash your hands first. You remember what we learned about microbes,” Carter said. One problem the kids faced this year was the lack of water for the garden. Everts said that the City of Minneapolis had promised them access to a hydrant, but they never got it. Instead the students created a water brigade, carrying water from the community center to water the plants. 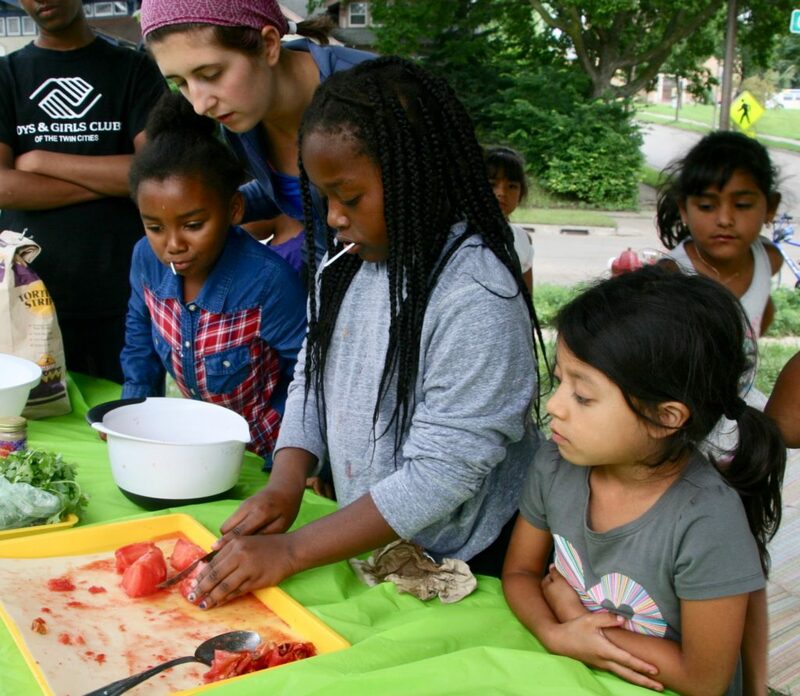 Although the summer program has ended, SELF, International has planned a fall schedule through the Minneapolis Community Education program. The summer food project had no official funding, and had to rely on donations from individuals and local businesses. Mother Earth Gardens and Bachman’s donated garden supplies, and the nonprofit received some donations from individuals.